On Sunday morning at St Mary’s we have our Remembrance Day Service. Like hundreds of thousands of churches worldwide, we shall be joined by members of the Armed Forces to remember those who have died in conflict. We shall have the procession of standards, wreaths will be laid, the choir will be singing We will remember them by Elgar, and we shall stand in silence for two minutes to remember the Fallen. As the organist for this service, it is an honour and truly humbling to be surrounded in church by war veterans, and by those who are serving their country. 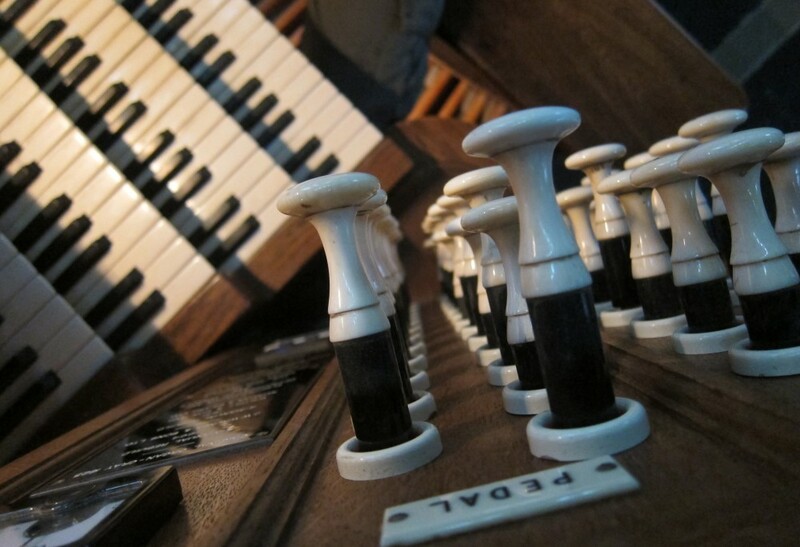 My focus is to do my best to make the music for the service memorable and fitting. I do not know of anyone who died in war or serving our country – my family tree sits neatly between the two World Wars, and so for the last few years I have focussed on one man during the two minutes’ silence. 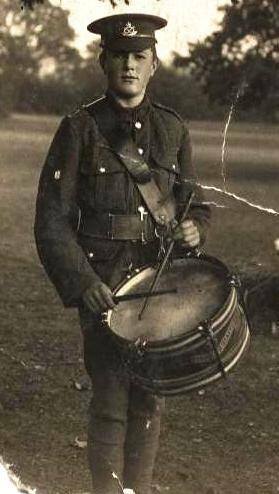 On June 9th 1914, Herbert, the boy in the picture, celebrated his 16th birthday by signing up to the North Staffordshire Regiment as a drummer boy. He was sent to Northern Ireland, and was there during the Irish uprising. In early 1916 he was shot at by civilians from the windows of houses in Dublin. Two years later he was transferred to the Leicestershire Regiment, and like tens of thousands of boys of his age, went off on an adventure to serve for his King & country. Herbert fought in the Battle of the Somme, where hundreds of thousands of British soldiers were killed and others suffered appalling conditions in the trenches. He was captured at the Battle of Ypres in 1917 and imprisoned. Whilst a prisoner, he had the bridge of his nose smashed in by a guard who found him scavenging for potato peelings from a bucket outside the ‘wire’. He then resolved to escape from captivity, a feat worthy of a Hollywood Movie in my books. He succeeded by hiding himself in a coal truck, covering himself with coal and was shunted out the next morning! He managed to get back to the line and remained with his battalion until the end of the war. After the war, like millions of other survivors he never spoke about his terrible ordeal, or of the horrific things he must have experienced as a POW or during battle. He suffered from ‘gassed lungs’ for the rest of his life and frequent bad headaches. In WWII he was too old to fight, but joined the ARP based at Tettenhall Institute. Even here he continued his heroism, rescuing an old lady from a bombed and burning house in Tettenhall, and he was awarded the Red Cross medal for his bravery. I am so proud to say that Herbert was my Grandfather – Herbert William Marple. Probably no different to millions of other teenagers who signed up to fight 100 years ago, a normal bloke. Regrettably, I never met him, he died before I was born, but by all accounts he was a thoroughly decent husband and father. I know he played the bugle as well as the drums, so I obviously share his likeness for loud, noisy instruments! Many of his other skills have been passed down through the genes, and show up in me at various times. Like his skill for escaping shows up in me whenever there is washing-up to be done. His habit of scavenging for food, every time I walk past a fish & chip shop – ( I rarely walk past without entering ). I guess that no-one beyond our family have ever heard of Pte Herbert William Marple. His impact on the world was probably not enormous – but I bet he would never have dreamt he would influence peoples’ lives for two minutes about a hundred years later. After all, if he had not escaped from that prison..
..he wouldn’t have met, fallen for and married Elsie Smith..
..had children, and then grandchildren..
…and you wouldn’t be reading this! Adrian – just read this – thanks – there is an old song about “Dads” or “Grandads” the words of which go as follows: “He couldn’t move a mountain – just like you or me – but my Daddy became a mighty big Man, with a mighty few words to say.” But Men, like your Grandad, don’t need to say much, you just watch the way they live and that is teaching enough. a blend you always manage to carry off! Thank you Adrian. A very poignant way to remember. My own parents served in WW2 as medics, and would talk freely about the camaraderie but rarely about the atrocities. Just too painful. I, also, will be sliding off the organ stool to observe the two minutes silence tomorrow – though I slide off less easily these days. But the sincerity with which I consider so many people’s sacrifices does not diminish. I won’t forget. Bless you. It is amazing to think of what he and thousands others like him achieved just by surviving that terrible conflict and its after effects and how subsequent generations came about because of their survival. And of course those whose deaths scared their families back home for the rest of their lives. It is a privilege to research and discover their stories and ponder our own connections to them. I’ve recently done that too, as we visited the Somme 2 weeks ago to retrace the last steps of my maternal grandmother’s cousin.